Online auction site eBay has been removing listings for Live 8 tickets from its pages after some appeared for sale priced at £1,000 a pair. The site's UK managing director, Doug McCallum, said the move came after it had listened to customers' concerns. Scores of free tickets for the 2 July concert in London - won through a text contest - had been put up for sale. 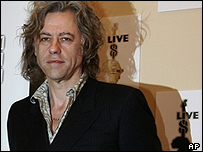 Live 8 organiser Bob Geldof branded the attempted sale of the tickets as "sick profiteering" and welcomed the move. He said people had realised that "the weakest people on our planet" were being exploited and they were "sickened by that". The minister for music, James Purnell, said he "wholeheartedly" shared Geldof's annoyance and had asked the site to halt the sales. 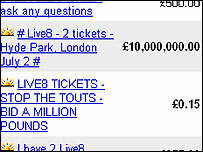 Live 8 promoter Harvey Goldsmith launched a wider attack on eBay, saying the company had general problem with ticket sales. "They have got to get their act together and decide what they are - they cannot be black-marketeers of tickets," he said. The site initially said it was not illegal to resell charity concert tickets. It offered to make a donation to Live 8 at least equivalent to the fees collected from ticket sales. But Geldof said of the offer: "It is filthy money made on the back of the poorest people on the planet. Stick it where it belongs." The site later decided to withdraw listings for tickets because of the concerns of their own customers, according to Mr McCallum. "Our customers said they were concerned about the profiteering rap being connected with the name of the site they're so passionate about," he said. Mr McCallum said it was unprecedented to end a listing. "It is extremely difficult for us to do, even if we wanted to, but in emergency circumstances, which is how our community is viewing this, we will do our darnest to." More than two million text entries were sent into the contest to win tickets for the London leg of Live 8, to be held at Hyde Park on 2 July. Entries were picked at random to receive tickets for the gig, which will include performances by Coldplay, Madonna and Pink Floyd.